OF ALL THE NEW plants that debut each spring, perennials and vines stir up the most excitement because they aren’t too big a commitment. It doesn’t take much garden space or cash to try out a satisfying number of new ones. Log House Plants comes up with remarkable plants every year. 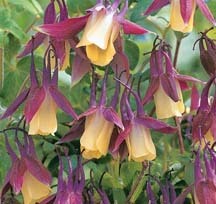 Their new columbine, Aquilegia ‘Black Currant Ice,’ has yellow and purple flowers as showy as an overblown fuchsia. If you’re a Husky fan, this plant’s color scheme is for you. The Oregon wholesale nursery also introduces hardy hibiscus called the Fleming series, with huge tissue paper-like blooms ranging from creamy white and pale yellow to the dark red ‘Fireball.’ These flashy flowers grow 3 to 4 feet tall, with leaves varying from dark green to purple or tinged with copper. Patio clematis are sized to grow in pots and small spaces, even though their flowers are as large and lovely as the more vigorous varieties. New this year is ‘Bourbon,’ with velvety purple flowers generously outlined in deep red, and Clematis ‘Angelique’ with large, finely cut lilac flowers. For more lilac a bit later in the season, look to the new Farmington aster (A. novi-belgii ‘Baldco’). It’s compact (to 18 inches tall) so it won’t flop, resists mildew, and has masses of pale lilac flowers set off against especially dark green foliage. Several new perennials are good news for drought-tolerant gardens. Sedum ‘Black Jack’ is statuesque, with deep purple leaves and butterfly-attracting pink flowers. And there’s a new coneflower rumored to be as sweet-smelling as a rose. Echinacea ‘Twilight,’ the most fragrant coneflower yet, is rose-red with a darker red cone. Echinacea ‘Harvest Moon’ is yellow with an orange cone. These are great cut flowers, long-lasting in the vase as well as in the ground. Agapanthus must be this year’s “it flower” because there are several new types of this showy perennial we used to think wasn’t hardy in our climate. Heronswood Nursery (360-297-4172; www.heronswood.com) is introducing A. praecox ‘Two Times Blue’ with double pale-blue flowers held high above mounds of strappy evergreen foliage. High Country Gardens offers a snowy agapanthus called ‘Cold Hardy White’ for those of you gardening in colder zones. This Santa Fe nursery specializes in drought-tolerant plants; another new one is Agastache x rupestris ‘Orange Flare,’ with fireball-colored flowers, and highly fragrant, finely textured gray foliage. (High Country Gardens; 800-925-9387; www.highcountrygardens.com). Also look to Heronswood for a promising new crocosmia called C. x crocosmiiflora ‘Eastern Promise’ with iris-like foliage growing more than 3 feet tall topped with tangerine flowers. And, of course, there are fabulous new heucheras. Will we never tire of these foliage plants produced in so many enticing colors and shapes? Among the new coral bells for ’06 are Heuchera ‘Snow Fire’ with rose-red flowers and leaves heavily spotted in creamy white; H. ‘Fantasia’ has silver-lobed leaves with pink reverse and pink flowers. And speaking of pale leaves, how can the near-white foliage of Brunnera ‘Looking Glass’ have enough chlorophyll to persist? But it’s a beauty. Green veining bisects the glowing silver-white, heart-shaped leaves of this shade lover that sprouts little blue flowers in spring. Various growers offer a slew of coreopsis in new colors, all long-blooming and easy-care. 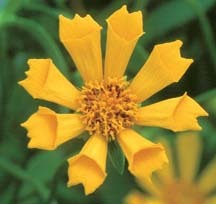 Instead of the typical daisy-like flower, C. ‘Zamphir’ has bright gold petals curled into trumpet-shaped little tubes. It looks like a sunny version of a seashell cosmos. I’ve already put in an order at White Flower Farm for the new ‘Autumn Blush’ coreopsis, which is buttery yellow with a mahogany blotch in the center. I plan to plant a bunch of them to foam up around a coral bark maple, as backdrop to an edging of yellow-striped Japanese forest grass. I’ll let you know if the combination looks anything like how I’ve pictured it. For plants that need to be ordered from specific nurseries, I’ve given the information you need to track them down; the rest of the plants should be widely available from retail nurseries within the next few months.